Award-winning violinist and Bachelor of Music Honours graduate Simone Slattery is this month’s Alumni in Focus. 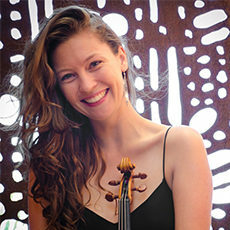 Simone is currently undertaking PhD studies at the University of Adelaide, creating editions and recordings of the little-known violin works of Ernest Bloch. She is the recipient of awards and scholarships from the Ian Potter Cultural Trust, the Thomas Elder Overseas Fund, the Australian String Quartet and the Elder Conservatorium of Music; and in 2014 was a finalist for the prestigious Jumpstart Jr Organisation in Amsterdam. Bush walking. Nothing says happiness to me like being out of phone range and surrounded by nature. Lucia’s Charcuterie in the Markets for my favourite no. 1 sandwich! Well to be honest, I feel they have only recently finished, having gone back for a PhD in recent years! However, if I could step back into those more youthful and innocent undergraduate days I would seize every opportunity that came my way, and if there weren’t enough opportunities, I’d create some more. My recently purchased trusty fiddle and partner in crime Claude a.k.a my nearly 300-year-old Parisian violin. Learning, I hope to be forever learning. The sound of a magpie warbling on a warm summer’s evening in Adelaide. Something you are grateful for? The ever-inspiring, ever-challenging and utterly essential part music plays in my life. Do something outdoors in nature. Being a musician requires a tad too much indoor time for my liking! That happiness must come from within. Three words your closest friends would use to describe you? This is a tricky one. Success is so different for each of us. I guess for me it is when the balance of hard work, learning, creativity and enjoyment all come together in a way that makes me feel energised and excited about what I’m doing. The higher you rise, the further you have to fall but to fall and pick yourself up again is the greatest learning in life. Practice, rehearse, perform, travel. Repeat in the next city. Creating my own project, Where Song Began and touring the piece all around Australia. Finally graduate from my PhD, undertake an action-packed Churchill Fellowship, and pursue new creative projects. Cooking and reading, two of life’s great pleasures (especially when paired with a cup of tea in the morning or a glass of wine in the evening). Take my shoes off. Life is better barefoot. The biggest risk you’ve taken? This entry was posted in Alumni eNews, Alumni Profiles and tagged alumni, elder conservatorium, Elder Conservatorium of Music, music, PhD, University of Adelaide. Bookmark the permalink.